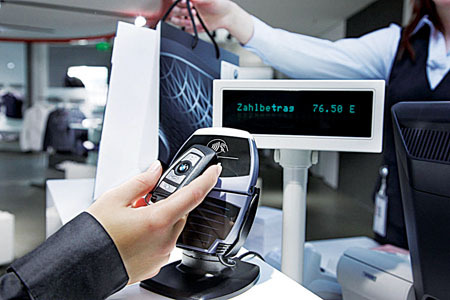 BMW Group Research and Technology has developed a prototype for a multifunctional car key which enables cashless payment and personalised vehicle access. “As part of our research project we first integrated a security chip into the key casing, which communicates across short distances by radio with a card reader,” says BMW's spokesman on this project. In future the key could also be used for other transport systems. Indeed, electronic tickets for bus, train and air travel could all be stored on the chip. The credit card function in the security chip allows electronic payments to be carried out quickly, securely and conveniently from the prototype key. Adding a personalised credit card function to the car key opens the door to a wealth of other mobility scenarios. For example, the holder of the key can enjoy secure in-car access to personal data since the key gives the driver authorised online access to his personalised ConnectedDrive services inside a BMW – not only when he’s travelling in his own car, but also from a BMW hire car, for example. Here, the driver identifies himself using his personal key and the car adopts his individual settings. Access to personal data such as address books, favourite radio stations and personal subscriptions to services and content providers is activated through the multifunctional key. Because the driver can be identified with total certainty, the key can now – for the first time – be linked to the car owner rather than any particular car. This also makes hiring cars and car sharing, for instance, even easier. “With the concept of integrating a cashless payment function into a car key, we are working on ways of linking up vehicle technology and lifestyle,” says Prof. Raymond Freymann, Director of BMW Group Research and Technology. Page generated in 0.1019 seconds.